We live in one of the most beautiful areas of central Montana. Imagine, your very own cabin nestled in the trees on Sweet Grass Creek. The beauty, the natural quiet. 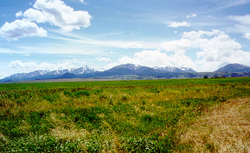 The majestic Crazy Mountains loom nearby under Montana's Big Sky. The WD is a 25,000 acre working cattle ranch offering working ranch vacations and great fishing. It is five miles to the nearest country store and post office. A half hour to the nearest town or to the trail head of Half Moon Park, the only public access on the east side of the Crazy Mountains, and two hours to Yellowstone National Park. Nature and wildlife abound. Eagles, Great Blue Herons, Sandhill Cranes, Curlews, deer, antelope and an occasional bear or elk. Fishing is just a couple of minutes walk out the front door. We offer 2 1/2 miles of private fishing along both sides of Sweet Grass Creek. The rainbow and brown trout are plentiful and the elusive big fish is sometimes found hiding along the bank. The Langston House, rented by the week or longer, offers total seclusion for those who like to have the creek to themselves. A great place for family reunions, featuring a lodge with indoor fireplace, outdoor fire pit and barbecue, volleyball court, horseshoes and plenty of space for camping. No RV hookups. There's plenty of hiking in the area. The Crazy Mountains offer many maintained hiking trails for day hikes or for longer camping trips. On the ranch, Porcupine Butte rises to 6790 feet offering a panoramic view of seven mountain ranges up to eighty miles away. Your accommodations feature a modern but simple, four room cottage within sight of the main ranch buildings, but secluded enough for privacy. A second log cabin, built in the 1930's, has recently been renovated. Both have fully equipped kitchens, and private baths with showers. Towels and linens are furnished and a VCR is available upon request. .